After being denounced as a collaborator, Louis Renault, already suffering from illness, was incarcerated at Fresnes prison on 23 September 1944. The conditions of his detention seriously aggravated his health, and he died one month later at the age of 67, without having had the opportunity to defend himself in Court. René de Peyrecave, his right-hand man during the Occupation, was imprisoned too but the case was dismissed in 1949 because SAUR (Société Anonyme des Usines Renault) had not been particularly helpful to the Occupiers. The company was confiscated by the Government on 15 November and nationalised 2 months later, under the name Régie nationale des usines Renault (RNUR). 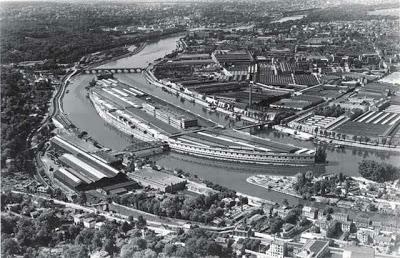 In 1939, the industrial site built by Renault extended to 100 ha and employed 38,000 people. At the end of the war, 80% had been destroyed by successive bombardments.